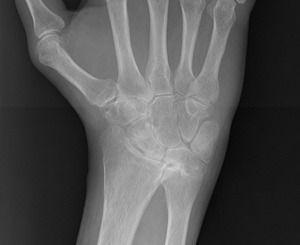 This young patient presented to me with wrist pain following a fall a year before. 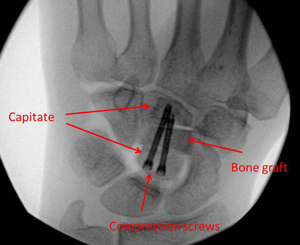 Subsequent x-rays and a MRI scan showed a very rare non-union of a fracture of the capitate. Under general anaesthetic the non-union was excised and grafted using a slice of bone from the iliac crest. 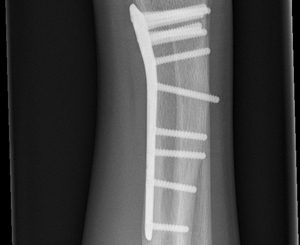 Fixation with compression screws. 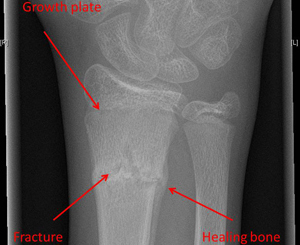 This boy had a fracture of the wrist which was treated in a plaster cast. 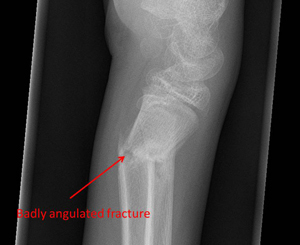 The fracture went on to heal in a badly angulated position. 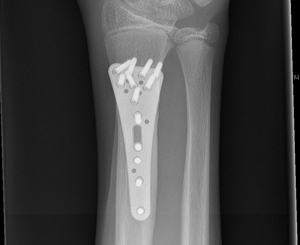 A corrective osteotomy was carried out and fixed using a Titanium plate. 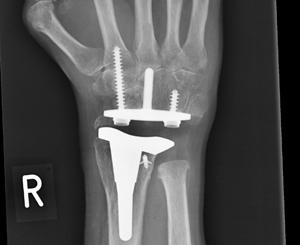 This patient with bad arthritis of the wrist underwent total wrist replacement with a good outcome.